History proves that to preserve independence is much more difficult than to gain it. Life has turned out that for the century Azerbaijan had to regain its sovereignty twice. Unfortunately, the first opportunity was lost shortly and the Azerbaijan Democratic Republic, which emerged in 1918 and existed only 23 months. Azerbaijan could ensure its state independence after the collapse of the Soviet empire in 1990s. The Constitutional Act on the State Independence of Azerbaijan was adopted on October 18, 1991, at a session of the Supreme Council of the Republic of Azerbaijan. With this significant historical document, the Azerbaijani people gained long-awaited freedom after years of oppression. 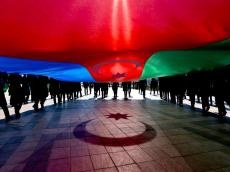 A nationwide vote was held in Azerbaijan on December 29, and the people voted unanimously for the state independence. The first years of independence was not easy for the young soereign country and it faced tremendous difficulties. On the one hand, the Armenian military aggression continued, on the other hand, the economy was in a paralyzed state due to the collapse of the existing system, and internal stability was disturbed in the country. There were concrete threats and risks to Azerbaijani statehood. Namely in that hard period the great leader Heydar Aliyev returned to Azerbaijan and came to power in 1993. Heydar Aliyev eliminated the chaos and anarchy, economic, political, spiritual and psychological tensions. Independent Azerbaijan marked a new course of development. Thus, he made the country’s independence eternal and irreversible. Turkey was the first state that recognized Azerbaijan’s independence in November 9, 1991 and a total of 50 countries recognized the independence of Azerbaijan by January 1992. On March 2, 1992 Azerbaijan became a member of the UN and its de facto recognition in the global community begins from this date. Today, Azerbaijan is one of the rapidly developing countries of the world from a economic points of view. Azerbaijan has become a leading country in the region, which has achieved a stable domestic political situation and sustainable economic development. No large-scale project in the region is considered without the participation of Azerbaijan. The Baku-Tbilisi-Ceyhan oil pipeline, implemented as part of the Contract of the Century, brought Caspian oil to the world market. This has contributed to peacekeeping and security in the South Caucasus and the future prosperity of the nation. The authority and fame of Azerbaijan in the international world is growing continuously. Azerbaijan is known all over the world as democratic, legal and secular state. The stability in our country and carrying out internal reforms positively affect the extension of the international relations. Azerbaijan is the only country in the world which has managed to become a transcontinental hub without having access to an ocean. The North-South project, which is currently being built and which will connect the Persian Gulf, Iran, Azerbaijan and Russia with a route to the highly developed Baltic region, will strengthen the transit role of Azerbaijan even more. As a result of economic and energy projects Azerbaijan had achieved many social and economic transformations. The national economy had grown, industrial production had increased, the level of poverty had decreased and budgetary expenses had increased. One of the greatest evidences of the economic development is the country’s GDP that is increasing year by year. So, in January to July 2018, GDP amounted to 43.48 billion manats ($25.58 billion), which is 0.2 percent more than the same period of last year. As for the country's foreign policy, priorities are based on maximum consideration of state interests and specifics of modern geopolitical situation. Foreign policy priorities take into account the most sensitive aspects. Presently, Azerbaijan’s domestic and foreign policy course serves as an example for regional states. The country develops dynamically in all areas, and its international prominence is ever growing. Successes achieved in the fields that conform to foreign policy priorities generally enable more dynamic diplomatic activity. In this context, a need arises to constantly review the priorities of the foreign policy. Thus, diplomacy that briskly adapts to rapidly changing geopolitical environment plays a pivotal role. Azerbaijan’s foreign policy priorities are generally known. Here, considerable significance is attached to bilateral relations. In the meantime, bolstering diplomatic activity within the international organizations is equally valuable. Nevertheless, at the present stage, resolution of Armenia-Azerbaijan, Nagorno Karabakh conflict constitutes a fundamental task for the foreign policy. Cooperation with international economic organizations, provisioning and execution of energy projects, performing as the transportation corridor between two continents are among other foreign policy priorities. Azerbaijan is the only country of the Caucasus to implement systematic programs throughout those areas. Azerbaijan, as an independent state, expanding and deepening its activities at the regional and global levels, including cooperation in the international arena, has become a member of the United Nations (UN), the Organization for Security and Co-operation in Europe (OSCE), the European Council, the Organization of Islamic Cooperation, the Commonwealth of Independent States (CIS) and other organizations. The Republic of Azerbaijan is also one of the founders of the GUAM regional organization. Moreover, Azerbaijan has shown that it is the perfect destination for major international sports and strategic summits that contribute to world peace and effective dialogue. Azerbaijan skillfully uses its economic and political opportunities to realize its own national interests, as well as strengthen regional and global positions. Azerbaijan is recognized as a leader in the region and a reliable partner in the international arena.